Not even the Wests Tigers’ near-win over the Broncos could match the Souths-Sea Eagles clash for its surprise factor in Round 3. After two weeks of frustration against the Warriors and then the Panthers, the Bunnies brought home their first win of the 2018 season against a Sea Eagles outfit that had won 54-0 against Parramatta the week before. With Robert Jennings scoring a hat trick and Richie Kennar clocking up two, it was a testament to the resilience of the Rabbitohs wing, and the best performance that the backline have put in since their tough win in the Charity Shield. Jennings was the first to put down points, a mere couple of minutes in, off a pair of back-to-back penalties from the Sea Eagles. At first, Angus Crichton looked to be the first to cross over, only for a massive, shuddering, trysaving tackle from Lachlan Croker to stop the big second-rower in his tracks. The Bunnies had already built up too much momentum, however, and so rapid movement over to the left side of the field, combined with a super cut-out pass, saw Jennings cross over moments after. With Adam Douehi unable to manage a challenging conversion, the Rabbitohs were only ahead by four points, and once they conceded their own pair of back-to-back penalties a couple of minutes later, the Sea Eagles glimpsed their first real field position and possession of the afternoon. They seemed to have build up the focus and resilience needed to score too, only for a massive hit-up from Sam Burgess after the second penalty to force Addin Fonua-Blake to give up the ball, and Kennar and Dane Gagai then dragging Tom Trbojevic over the line on the next Sea Eagles set. As luck would have it, Gagai and Kennar were penalised on the drag, but Manly probably wished, in retrospect, that they’d been forced to turn over the ball then and there, since the set ended in the worst possible way imaginable – with a grubber from Daly Cherry-Evans that initially looked as if it might be the perfect answer to all the Sea Eagles’ stuttering escalation of field position and possession, only for Alex Johnston to scoop up the footy right on the try line, dodge through the Manly defence, and the run the entire length of the field to ground it right beside the posts. In effect, then, DCE’s grubber had set up Souths for their second try – a reversal so dispiriting that it’s probably reasonable to date the Sea Eagles’ disastrous loss from this point, so emphatically did Johnston’s four points puncture the visitors’ momentum and sense of cohesion. Only Apisai Koroisai came close to bringing him to ground, but with that amount of space Johnston is almost impossible to catch, and the rest of the Manly players seemed to know it, resigned to watch and wait as their best tryscoring opportunity of the game resulted in four more Bunnies points. It took a while for the Rabbitohs to score again, but when they did it was just as spectacular, coming at the end of a stunning set in which Johnston looked set to crash over in the left corner, only for Brad Parker to put in a trysaving tackle to rival Croker’s containment of Crichton earlier in the game. The Bunnies didn’t despair, however, as Cody Walker ended the set with a deft crossfield kick, Crichton jumped up to pop it back, Brian Kelly collected it and fumbled it, and Crichton then put in a superp follow-up effort to dive to ground, take control of the footy and then offload it to Gagai, who rapidly shifted it across to Kennar to crash over for four more points. In the blink of an eye, the Bunnies had gone from scoring in one wing to scoring in the other – a testament to the massive, sweeping moments of vision that characterised their game across the entire afternoon, and a staggering edifice for the Sea Eagles to contemplate defending, even if Doueihi once again struggled to land the conversion, with the Steeden bouncing off the uprights and away to the right. A couple of minutes later, however, the young halfback made a more emphatic gesture by collecting a fifth tackle kick from Tom Trbojevic and burning up the sideline, only to be contained by DCE and narrowly avoid being dragged into touch. Still, this was close enough to Johnston’s superb run to galvanise the Bunnies, and with Johnston himself putting in an equally superb harbour bridge pass to Walker, the cardinal and myrtle were within the twenty by the third tackle and looked all but guaranteed to score. In one of the beats that can change the whole course of a game, though, Walker paused to try and reset and straighten the play, jettisoning the Rabbitohs’ momentum as the Sea Eagles resumed their focus after the shock of Doueihi’s run, allowing Tom Turbo to clean up Souths’ fifth tackle kick shortly after. The relief of keeping out the Rabbitohs led to a renewed period of possession and field position from Manly as the first stanza drew to a close, starting with an excellent attack, and some really creative inroads on the ruck, and followed by a terrific defensive set, culminating with Jorge Taufua bumping Kennar into touch midway through the tackle count. A set later, some deft movement out to the left edge allowed Tom Turbo to poke his nose through the line, and probably would have resulted in four more points had Curtis Sironen not slipped right in front of the posts. As luck would have it, however, the Bunnies were deemed offside, gifting the Sea Eagles a fresh set of six, and while the hosts may have contained yet another fifth tackle grubber from DCE, their foothold didn’t feel quite as secure as it had during the opening minutes of the game, especially as they’d started off with a 14-0 lead before being beaten by the Panthers the week before. At the same time, however, they’d managed to keep Manly out for a full forty, and while the Sea Eagles had definitely come back in these last few minutes, they hadn’t come close to the sublime flow state that had allowed them to tower so triumphantly over Parramatta. In other words, the second stanza still felt like anyone’s game, and it was just as urgent for the Rabbitohs that they their lead as it was for the Sea Eagles to attack it. It was a statement of purpose, then, when Kennar, Gagai, Doueihi and Crichton dragged Fonua-Blake over the sideline thirty seconds in – from about seven metres infield – taking advantage of the slippery conditions more emphatically than anyone else so far, even if the rain was starting to gradually abate by this point in the day. If seeing the big Manly prop thwarted by the Rabbitohs defence brought back memories of the opening act, then the sense of déjà vu was completed when Jennings crossed over once again, and off the back of almost the same movement – rapid movement over to the wing, culminating with a perfectly timed cut-out pass. Given the extent to which the Bunnies have struggled to score over the course of the second forty in 2018, this repeat try felt particularly auspicious, and was probably the watershed moment of the game for the cardinal and myrtle, even if Doueihi once again failed to slot the Steeden through the posts for an additional two points. The Sea Eagles seemed to sense it, too, regathering their efforts over the next couple of sets, and eventually crashing over for their one and only try – a short-range effort that saw Jackson Hastings put in a massive show-and-go right on the line and then weave through the South Sydney defence, slamming to ground with Crichton clutching onto his back. No doubt, DCE’s conversion was a thing of beauty alongside Doueihi’s more frustrayted efforts, but it was also a sober reminder of just how much further ahead the hosts would have been if they’d manage to add the extras. In any case, the Sea Eagles didn’t get much of a chance to enjoy their advantage, with the Rabbitohs putting down four more points shortly afterwards on the back of a rare instance of poor judgement from Tom Trbojevic, who jumped too early for the high ball and knocked it back into Kennar’s head, allowing the ex-Bulldogs to take possession and slam over the line. At first, it looked as if Doueihi might have tackled Turbo in the air, but the replay showed that the Manly fullback had already lost the ball, and had a foot on the ground anyway by the time Doeuihi hit him on the chest. 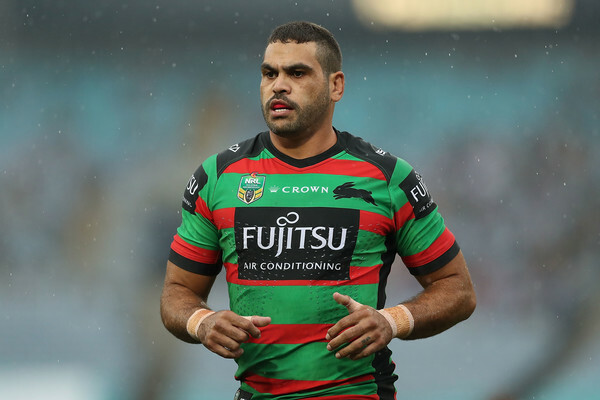 By this stage, then, both wingers had doubles, and with Doueihi slotting through his first conversion it finally felt as if the Bunnies had settled into the momentum that they’d enjoyed during the Charity Shield, but struggled to retain during the first two rounds of the regular footy season. It felt both inevitable and miraculous, then, when Jennings crossed over for his third try a couple of sets later, celebrating his first hattrick, like his brother Michael, in his twenty-first game of first-grade football. If Jennings’ second four-pointer had seemed to the best parts of the first stanza, then this third four-point seemed to correct the worst parts of the first stanza for the Bunnies, with Inglis eluding Parker to manage the offload to his winger this time around, and Doueihi managing his first really challenging conversion of the evening so far, booting the ball to the right and then watching it spin around and pass through the posts. Despite a series of opportunities right on the Bunnies’ line, the Sea Eagles remained powerless to make a dent in that momentum either, with Kennar and Gagai’s massive trysaving tackle on Taufua right in the wing saying it all. The Bunnies didn’t need to score again to leave the feel triumphant, but a late try from Hymel Hunt made that sense of correction feel even more emphatic, with a pitch-perfect fifth-tackle kick from Douiehi changing hands a few times before G.I. once again played the role of try assister, offloading to Hunt to make it 34-6 at the final siren. After two weeks of frustration, the Rabbitohs hadn’t merely pulled off a win, but the win needed to renew their sense of mythology and purpose as they reconsolidate under a new coach, and their fans will be waiting with bated breath to see whether they can retain that magic when they take on the Bulldogs next week.